Rose gold, so bold: Pioneer 46 features rose gold mirrored lenses in a polished pepper tortoise acetate frame. Gold aluminum side inlays ensure you’ll always shine brightly. It all started here: The classic Westward Leaning sunglass, Pioneer was our debut frame shape. We set out to create the perfect wayfarer using only the finest materials and best craftsmanship. Each frame is meticulously handmade in Japan and features high-quality shatterproof lenses with 100% UV protection. The Pioneer shape was designed to be comfortable and flattering on all face shapes. Its super-durable construction and smooth, high-quality hinges ensure these will be your favorite shades for years to come. Design the Pioneer to fit your style! 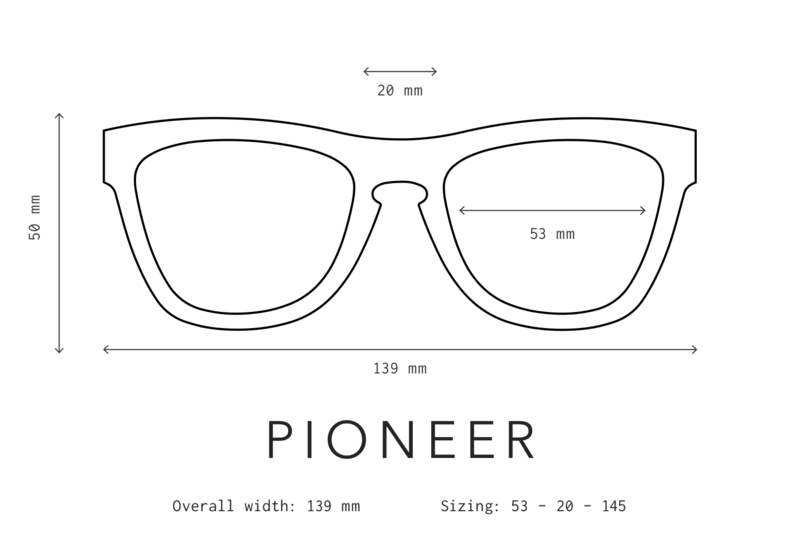 Pioneer, our first design launched in 2012, is an original take on the wayfarer shape which pays tribute to California's pioneering heritage. It represents our hope, determination, and goodwill for California's future and is the gold standard of our collection.